Here is a wonderful gold charm bracelet with 18 charms weighing a hefty 82 grams. With the exception of a gilt silver enamel fish, all are either 14k or 18k. The sturdy 14k bracelet is marked 585 SVG and is perhaps Scandinavian. The enamel mandolin and lama in a circle are marked 18k. There is a marked 19k cuckoo clock. Those marked 14k include a pagoda, chimney sweep, bunch of bananas, cable car, Nefertiti, enamel beetle, and a New Bedford fishing charm(man with harpoon). 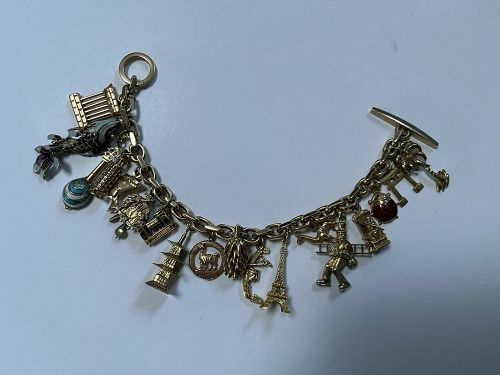 These remaining charms were all tested and may have faint/indistinct marks: 18k gondola, 18k Leaning tower of Pisa, 18k Eiffel tower, 18k lama, 14k Greek column, and 14k palm tree.